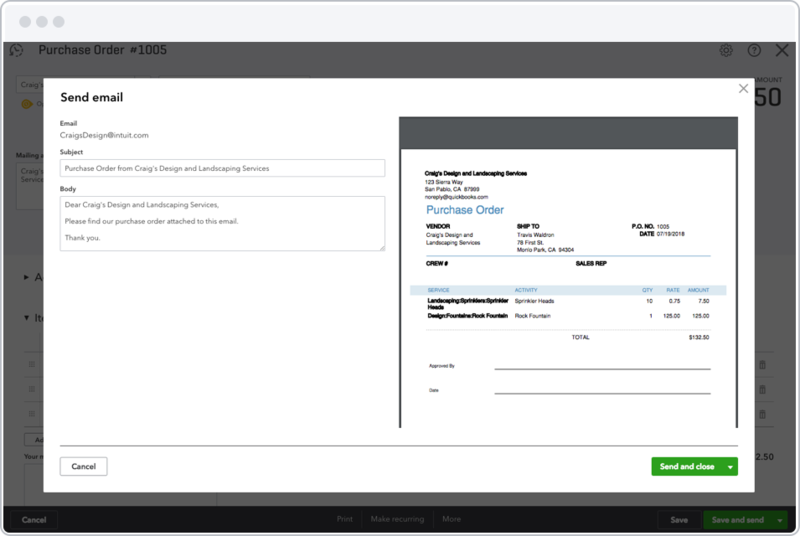 Create customizable purchase orders with QuickBooks. Get your purchase orders done fast. Easily create purchase orders, complete with custom PO numbers, with QuickBooks. Add your company logo, colors, address, and other custom fields. Do you frequently work with a particular vendor? Set it and forget it! QuickBooks makes it easy to schedule purchase orders for recurring purchases. Once an order is complete, QuickBooks automatically copies the items, quantities, and rates from your purchase order and turns it into a bill. Send bills to your customers from QuickBooks so that they can pay via credit card, debit card, Square, or other payment service. QuickBooks takes care of the payment processing and tracks everything for you. Always know what you’ve ordered and see when it’s coming with QuickBooks. In a quick glance at the Vendor Dashboard, you can see your vendor’s details including unbilled POs, open bills, overdue bills, and bills that have been paid. Keep inventory moving so your business can grow. The key difference between a purchase order (PO) and an invoice is that a purchase order confirms that an order has been placed while an invoice or bill is a request for payment for an order. When customers places orders, they usually need a purchase order with a unique PO number (purchase order number) for their accounts payable process. POs also help you keep track of the orders you need to fulfill and whether they’ve been completed or not. Once an order has been fulfilled, a purchase order PO should be converted to a bill or invoice and sent to the customer for payment. It’s easy to manage this process in QuickBooks. QuickBooks can convert POs to invoices, send them via email, and track incoming payments. Automating the purchase order process is a great idea for any small business owner or independent contractor. It not only increases efficiency, but the next time your customer places an order, QuickBooks has all the details it needs to create a new PO. With QuickBooks, it’s also easy to automate the purchase order management process for recurring orders by scheduling purchase orders. More than purchase orders. Run your entire business with QuickBooks. With QuickBooks Plus, inventory quantity is adjusted automatically as you work, so you always know which items are best-sellers, how many you have on-hand, and if your stock is getting low. We’ll even alert you when it’s time to reorder inventory. Do you need a loan to purchase raw materials, supplies, or equipment? No problem. With QuickBooks Capital, we use the financial data you already track in QuickBooks to help you apply for a small business loan. If you employ 1099 independent contractors, QuickBooks makes it easy to map contractor payments to the correct boxes on the 1099 tax form. Then at tax time, e-file your 1099 forms online with the the IRS. A well structured contract will cover a wide variety of variables, set expectations, and keep you protected in the event of a disagreement in your business relationships. Learn how a contract can protect you. This comprehensive invoice guide walks you through each step of the process, covering all the basics of invoicing, including invoice number tracking, required fields in an invoice, and more. Invoice payment terms outline how, when, and by what method a customer remits payment to a seller. This guide will equip you with the skills you need to set ideal payment terms for your customers. How can I create a purchase order (PO) in QuickBooks? Click the plus sign at the top of the screen and click Purchase Order. Choose a vendor in the Vendor drop-down list or add a new one. If you’re purchasing something for a customer, choose a customer in the Ship To drop-down list. Enter the products or services you want to purchase in the Item Detail section. Click Save and Close to save the purchase order. You can also send the purchase order to the vendor by clicking the Save and Send button. Can I issue a purchase order a second time without making it a recurring PO? Yes. Purchase orders can be copied right from a Vendor’s detail page. You can select the PO you want to copy and QuickBooks will automatically generate a new PO with the same information.